The personal pace system by Toro means that this self-propelled machine will automatically adjust to your walking speed for your convenience. Also coming equipped with an electric start! 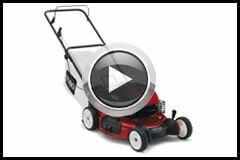 So starting your mower was never easier. Powered by a reliable Toro TXP 159cc OHV engine the 22" cutting deck with a bar blade means that you can spend more time doing the thing you love and less time mowing your lawn as it will power through your lawn in no time. And the Bag on demand switch allows you to switch from mulching to catcher instantly for convenience and practicality. This mower also comes with Toro's 3-year guaranteed-to-start including a 2 year full coverage warranty! Meaning if anything goes wrong, under normal use and maintenance Toro will fix it for free!